i don't get out much after dark. there's no island bus service after 6pm, i don't own a motor car, and there are too many top gear watching idiots trying to find just how many miles per hour they can achieve along the island's twisty roads. if i'm truly honest, it's the latter that gives me greatest cause for concern. the croft is but a few hundred metres from bowmore's famous round church, an iconic building that sits proudly at the top of main street. for reasons that entirely escape me, it seems the round building acts as a pivot point for those intent on using as much (expensive) petrol accelerating from the harbour to the top of the hill, followed by as much tyre screeching as possible while leveraging their darkened screen corsas and subarus onto the low road and screaming past the bothy on a very short drag strip to bowmore distillery's bonded warehouses. it is a repetitious evening procedure, sonically accompanied by souped-up engines feeding into drainpipe exhausts for that jeremy clarkson approved buzz. in truth, i am sufficiently attached to my wellbeing to fervently wish not to place it in the path of any of the aforementioned. i don't doubt that these vehicles are festooned with appropriate levels of exterior illumination, but at such speeds, it would take only an irritatingly placed blind corner to find me and the cielo decorating the radiator grill. however, it would be a great untruth and deliberate misapprehension to have you believe that there are times when i wish to travel someplace after the hours of darkness. 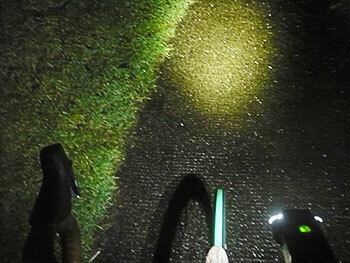 in such cases, i'd be looking not only for a bicycle light that offered to identify me as being on the road on the first place, but one that would suitably illuminate my path when on more poorly or unlit roads. the ideal specification would include a reasonable battery life along with the option to replace the original battery fairly speedily, should my darkened travels be interrupted by any form of mechanical malfeasance. even a rudimentary online search would quickly identify lezyne's mega-drive as one of the more appropriate options at a not stunningly over-exorbitant price. the mega-drive arrives in a small, foam-padded box that includes pretty much every accessory needed to make best use of the light. or at least it seems that way on first opening. included in custome slots are the finned, aluminium light itself with a lithium-ion battery already in place. 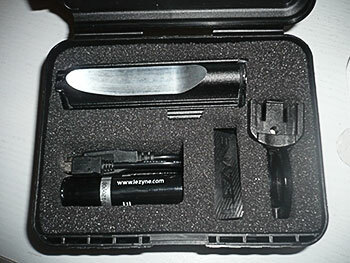 there is an additional battery included with the set as well as a usb/micro usb cable to allow charging via a computer or by means of one of the mains adaptors kindly supplied by distributors upgrade. according to lezyne, recharge time is between five and ten hours, but it seems the batteries supplied were at least partially charged, as it took less than an hour to have the button remain green. also in the box are two differently sized cnc hinged clamps, one already with the mounting bracket in place. there are also a couple of differing thicknesses of rubber gasket to place between clamp and handlebar. this is where things started to head ever so slightly downhill. i intended to fit the mega-drive to the oval concept classic bars on the cielo, yet the smaller of the two clamps was simply not large enough to be affixed to the bar, even without either of the rubber gaskets. disappointingly the bigger of the two turned out to be too large to fit the selfsame bar even with both gaskets in place. a bit of a fail in this department. i tried to fit the larger bracket to the ibis badged bars on the hakkalugi, but it would only just fit, minus either gasket, and that promised to be somewhat unkind to the metal. the same story was true of the carbon bars on my c40 and alloys on the master. i subsequently had little option but to fit the larger clamp to the top edge of the brooks bar tape under which the brake and gear cables sat. here's where it didn't actually get much better. the mounting bracket can be sited facing forward or backward; there is nothing in the multi-language instructions to indicate which is the preferred option. however, the mount itself is integral to the mega-drive's aluminium casing and features a bevelled lip on its rear edge, so i assumed this, by implication, meant the bracket ought to be installed at the front of the bars. the nature of the bracket allows its partial rotation (a handy and pragmatic feature) due to the top part being threaded for the mounting bolt. 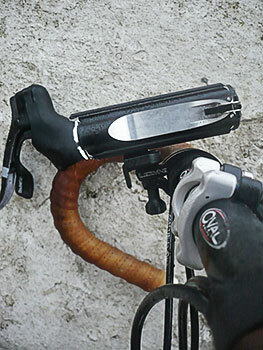 however, the release lever prevents the mounting section from turning through 180 degrees. 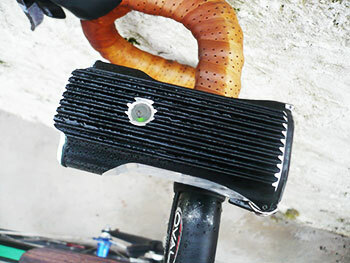 thus, the bracket is sitting in front of the bars, compeletely unsupported. the integral bracket is sited towards the front portion of the light, another factor that mitigates against fitting the bracket towards the rear. having first charged the battery, the rubber button atop the light offers three standard modes: once for full beam, twice for dipped beam and thrice for flashing. quizzically, there is a further two modes achieved by holding the button for five seconds or more which offers blast and enduro modes. as evidenced above, i tend not to venture out after dark too often, so the bulk of the mega-drive's travails were spent in flashing mode, where i have less need of seeing than being seen. even in this mode, the brightness of the two leds was, to coin a phrase awesome. road signs well over two hundred metres distant, in regular daylight, were in receipt of substantial illumination. however, the bracket design was a big let down. i'll admit that my affixation of the latter was not as recommended in the not overly informative instructions, but even with the bolt tightened as fiercely as i could muster, over less than palatable road surfaces, the light had a tendency to dip either forwards or backwards (i tried the bracket in both fore and aft positions just in case). i can appreciate that a finger tightened bolt offers perhaps more practicalities than one fitted via spanner or screwdriver, but had either the bracket been sited atop the bar, and thus supported by it, and the integral mount been shifted to the mega drive's centre of gravity, these problems would likely not have made themselves known. as a confirmed roadie, having to frequently straighten up the light was simply in the realm of irritating. however, for those more endeared of offroad adventures, it could be something of a liability, making it a less than positive choice. however, most of us are possessed of the figure it out gene, meaning it would take only a few homebrew measures to sort this out to your own satisfaction. i'd warrant however, that a light costing very close to £200 ought not to bring with it such baggage. the illumination qualities, on the other hand, are hard to beat. 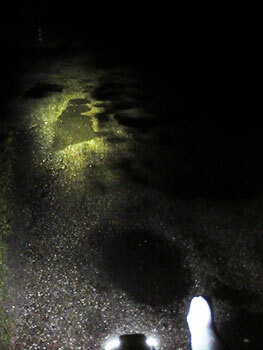 full beam (1000 lumens) would not be out of place on the daily flybe flight from glasgow, with so-called dipped beam just being something of a consideration towards oncoming motorists. the on/off/mode button allows the rider to check battery level on the fly. the option of carrying a second, fully-charged battery doubles ride time at full blast to around three hours. on a single battery, enduro mode gives 500 lumens for 2.5hrs (a contention i am happy to verify), economy provides 250 lumens for 5.5 hours and flash mode provides the same 250 lumens for ten hours. not that the thought had originally occurred, but my two extended daylight rides in flash mode were accmpanied by substantial quantities of galeforce wind driven rain, the sort of malevolent precipitation that has an uncanny tendency to find any tiny little gaps into which it might annoyingly enter. yet the battery bay remained satisfyingly and thankfully dry on both occasions. strenuously avoiding bowmore's boy racers after dark, the brightness of the mega-drive was remarkably impressive, at which point the available rotation of that bar mounted bracket came handily into its own. many of islay's roads are edged either by grassy ditches or wide open stretches of field, and nary a white line to be seen. it is thus a more than handy feature to be able to angle the beam(s) ever so slightly towards the left road edge. 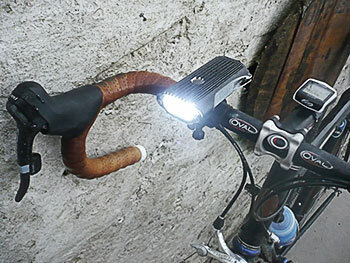 it's surprising just how few front bicycle lights offer this option. in view of the heat-sink design of the aluminium body, the ruggedness and precision of construction and the inclusion of a second battery, the price ought not to be considered an obstacle. there are one or two others on the market where a spare or replacement battery can cost in excess of £100. however, to make the mega-drive the only option you'd consider, they really need to do something about that fitting bracket.